Lazy B Waterfront Suite sleeps up to 4 guests. 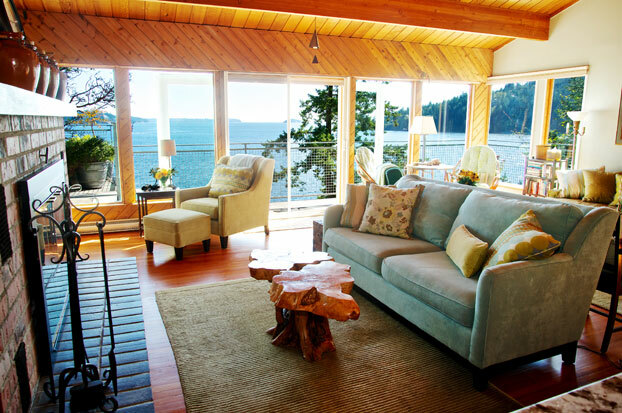 One Inviting Bowen Island Waterfront Home with Spectacular Views—3 Ways to Stay! 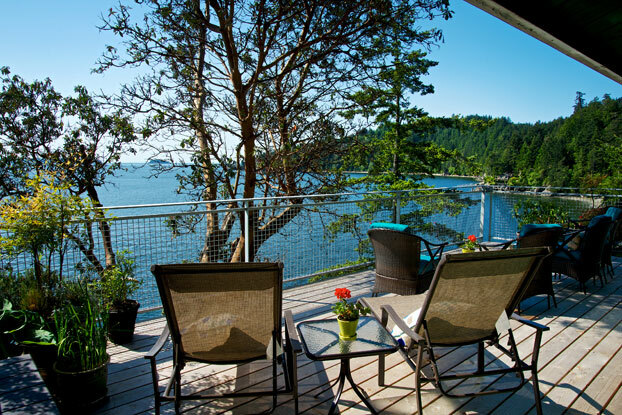 Relax at our secluded family-owned home/duplex at an exclusive south-facing waterfront setting on the east side of Bowen Island. From spacious waterfront decks, take in the sunny ocean view and regal Coastal Mountains. Stroll down a wooded trail to enjoy the neighbourhood swimming dock and beach—just one minute away. Take a short eight-minute drive to the Cove and rent a kayak to explore Bowen by water, or hike the variety of trails and revel in the island’s natural beauty. Looking for an exceptionally private and romantic retreat? 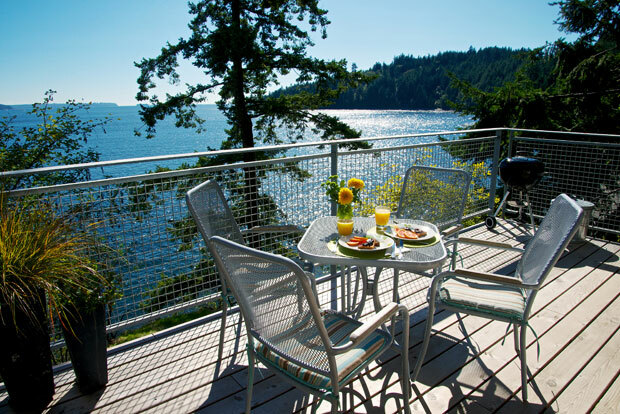 Book the Whole House—the entire home!—for just you and your sweetheart and have this beautiful stretch of scenic Bowen Island all to yourself. smoking is prohibited at this vacation rental. The Lazy Bowen Hideaway is equipped with a full washroom and sleeps up to four guests in two bedrooms, each with a queen bed, flat-screen TV and fine linens. Contemporary furnishings complement family heirlooms for a polished, yet comfortable ambience, professionally designed by your host. Mother Nature’s spectacular sea views will take your breath away through panoramic floor-to-ceiling windows. Dine and lounge in the relaxing open-concept kitchen and dining area. Laze in splendorous sunshine on the private, spacious waterfront deck. At this waterfront hideaway you will even delight in rainy weather—you’ll welcome an excuse to stay in! Prepare a meal in the elegant gourmet kitchen. Stoke the flames in the wood-burning fireplace. 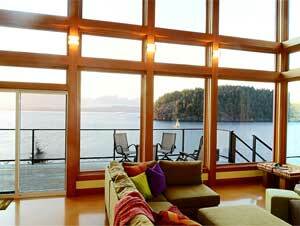 This is your refined Bowen Island getaway, complete with magnificent views. Make the most of it! This studio suite is equipped with a three-piece washroom, including a walk-in glass-enclosed shower. It sleeps up to four guests in a semi-private sleeping area with a plush queen bed and an optional twin bed, both gently partitioned from the living area by a quaint wood-burning stove. The sleeper sofa in the living room has been upgraded from contemporary to comfortable! Cozy and bright, the Lazy B Waterfront Suite will always remind you where you are. The vast, blue ocean water is just as much a part of this self-contained studio as its carefully chosen design elements. Take in the waterfront beauty from two private, spacious decks—one offers shelter, while the other opens to endless blue sky and sunshine. Ocean views will beckon to you while preparing your meals in the efficient granite kitchen or lounging in the comfortable and stylish living room. This cozy getaway is the result of a labour of love from interior designer (and your host!) Jan Stevens, whose family has owned this waterfront home for two generations. Rent the whole house / duplex for 2 – 8 friends or family. Enjoy the best of both worlds and stay at both the Lazy Bowen Hideaway and the Lazy B Waterfront Suite , accommodating a group of eight or a couple seeking absolute privacy. Two kitchens. Two living areas. Twice the stunning ocean and mountain views, from indoor and outdoor living areas. 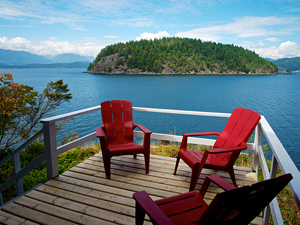 The Whole House is undeniably one of the most unforgettable waterfront vacations on Bowen Island. 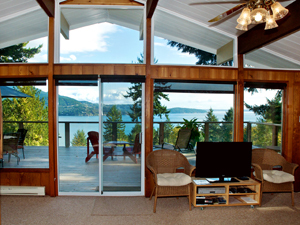 INVITING BOWEN ISLAND WATERFRONT HOME, SPECTACULAR VIEW—3 WAYS TO STAY!